Opioid drugs are effective painkillers. Made from the opium poppy or synthetically produced, opioids can also make you feel intense pleasure. People who misuse or abuse these drugs can easily become addicted to them. Opioid medications include: codeine, morphine, hydromorphone (Dilaudid®), oxycodone (Percodan®), hydrocodone (Lortab®), Fentanyl (Sublimaze®), meperidene (Demerol®), pentazocine (Talwin?) and propoxyphene (Darvon®). Some opioids like codeine and Darvon® can be combined with drugs like Aspirin® (ASA) and Tylenol® (acetaminophen) to increase pain relief. Opioid medications can be taken in tablet form or injected. Illegal possession, prescription shopping, producing, and trafficking in opioids can result in fines or prison sentences. Prescription shopping is getting prescriptions for opioids without telling the doctor you had another opioid prescription in the last 30 days. Low doses of opioid drugs can impair your ability to drive. Very high doses can cause disorientation, convulsions, and hallucinations. Overdose can result in coma and death. Combining opioid drugs with other depressants like alcohol or tranquilizers is especially dangerous. People who take opioid drugs for a long time can feel depressed, have difficulty concentrating and sleeping, and have sexual problems. Constipation can become a very serious problem. Long-term use of codeine with Aspirin can cause stomach bleeding. 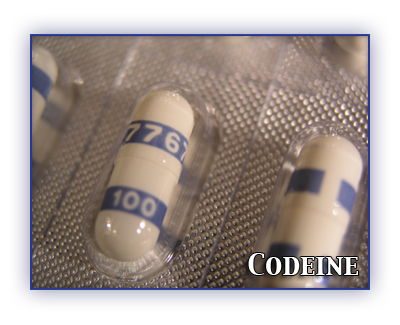 Long-term use of codeine with Tylenol can cause kidney and liver damage. When you take opioid drugs for a long time, your body stops making natural painkillers so even small pains seem severe when the drug leaves your body. Taking large doses for long periods can cause agitation, tremors, and seizures. Doctors avoid prescribing opioid drugs to pregnant women. Although the effects on the fetus are not known, babies born to women addicted to opioids are often addicted and go through withdrawal after birth. If you use a lot of opioid painkillers, you may find that you need more and more to feel the same effects. You can become mentally and physically dependent, or addicted to how they make you feel. Dependent users who quit using opioids get withdrawal symptoms like craving, runny nose, yawning, sweating, restless sleep, weakness, stomach cramps, nausea, vomiting, diarrhea, muscle spasms, chills, irritability and pain. The worst symptoms pass within a few days, but it can take months to feel normal. It is best to stop using under supervised care. If you have an addiction to alcohol or any other drug, you should not take opioids because they can make you relapse.